Have you and your congregation come to realize that your church needs a change, whether it be for a health and safety reason or an aesthetic purpose? Or, are you ready for the leap into a church construction project from the ground up? Taking the first steps into your church renovation or church construction project can be daunting, at best. The team at Herr & Co. is here to help. For over a year now, Herr & Co. has been walking Park View Mennonite Church (PVMC) through their massive renovation process. Pastor Phil Kniss from the church has been a pleasure to work with, and he agreed to help us tell the story and help future customers make the best decisions possible when preparing for and navigating through their church renovation. 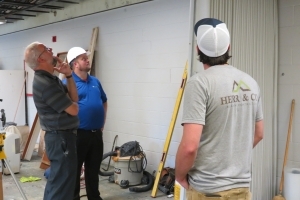 When asked what started the PVMC church renovation project, Phil openly admitted that he and the congregation had a growing awareness of an air quality issue in their building. It was beginning to affect a few members of their church, and they decided to take action and appeal to the needs of each member. The building also serves as a gathering place for local organizations and a preschool, so making changes toward better health and safety was a clear choice. It then raised the question: Where do we start? Phil began by contacting Proactive Indoor Health for a mold evaluation. With their results, the congregation knew it was time to start planning for a large church renovation. How did PVMC choose the professionals to carry-out the project? They chose a team. 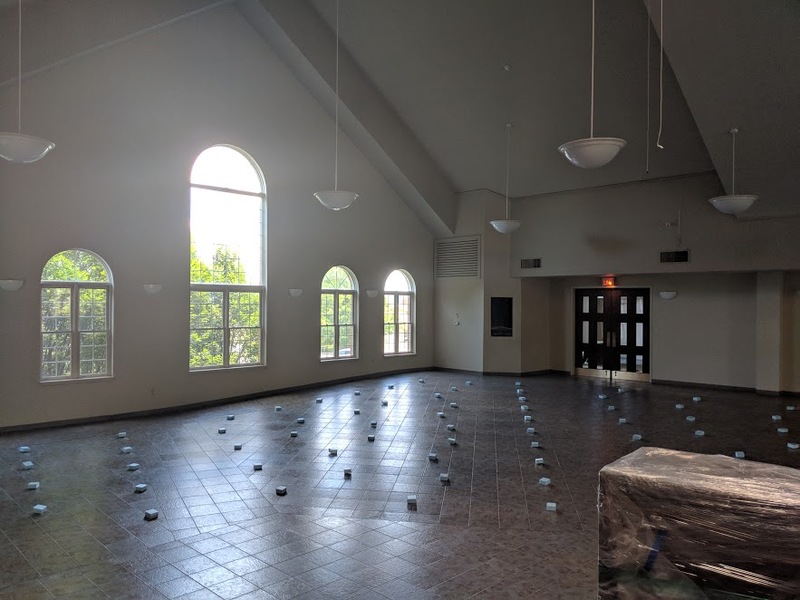 By choosing an architect, a building contractor, and a mechanical engineer who had worked together often, the church had a more efficient use of their budget (as opposed to taking the time and spending the money to open the project for bidding). Not to mention, the seamless communication between the three companies has proven to be an advantage throughout such a large and interwoven project. As with any major renovation, the PVMC church renovation has had many layers. 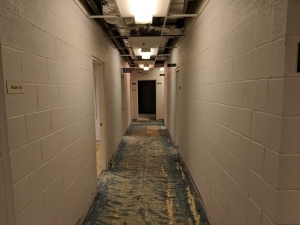 Nearly every square foot of the building has been affected by physical changes needed to address the air quality issues. Fresh air does not simply come from new ductwork. Herr & Co., with the help of Gaines Group Architects, Suter Engineering, and Excel Heating and Cooling, has helped “peel the onion” that led to poor air quality in the building. Sources of the problem have ranged from poor insulation and proportion of the old ductwork, mystery leaks from plumbing, and improperly directed outdoor runoff. With patience and attention to detail, each problem has been addressed. 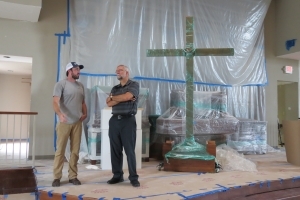 Phil admitted that the project’s depth has changed the layout of the church’s budget, but the congregation is on-board with the necessity of the renovations. Herr & Co. has worked with the church to manage the budget and still make sustainable changes, such as replacing the old fluorescent light bulbs with new LED fixtures. This will drastically increase the efficiency and thus give the church a financial advantage over time. The church’s steeple was also able to be saved and re-mounted aboard a sloped rubber roof that will prevent the previous water damage from reoccurring. Emotional attachments to the old and the necessity of the new often conflict, but this was one of several examples of Herr & Co.’s dedication to helping preserve the important pieces of history during a church renovation. Air quality, accessibility, acoustics, and endless other factors come into play when making changes to your place of worship. It is best to contact an experienced contractor who can walk with you throughout the project. Herr & Co. offers on-site walk-throughs and online platforms to keep communication 100% transparent and answer any questions you may have during the process. The length of a church renovation project can vary greatly, from months to years. Once you have met with your building contractor and know your time frame, begin networking with other local churches and/or gathering areas to ensure you will have a safe and convenient meeting space for your congregation. Phil reminisced on the various places they have held worships, meetings, funerals, and weddings over the last several months. Creativity is key (the PVMC even held a “block party” worship in their parking lot with the help of Herr & Co., and the event drew-in new community members). 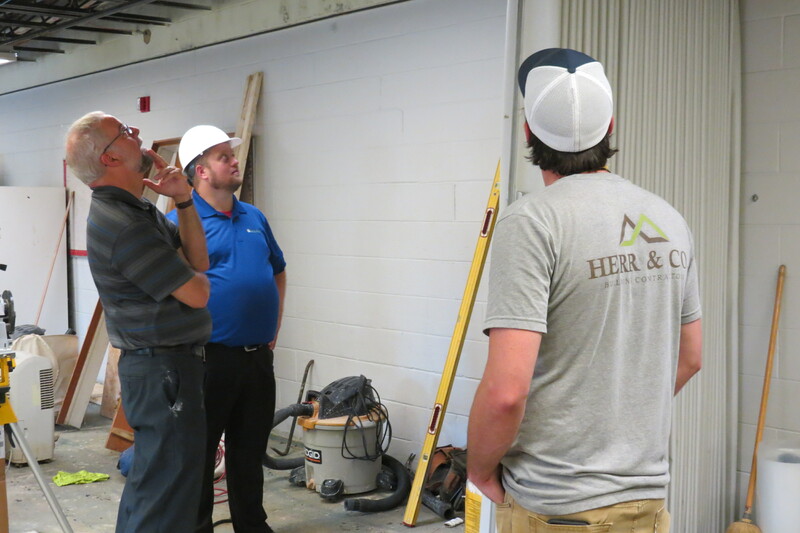 Meeting deadlines can be tricky in most construction projects, but the waiting time can also be an excellent opportunity for a church to build teamwork and relationships with others in the community. Contact Us About Your Church Renovation Project Today!